Perhaps the most unusual job ardes have ever had was the creation of logos for “Hufu”—a tofu-based product that is supposedly textured & flavoured to resemble human flesh. 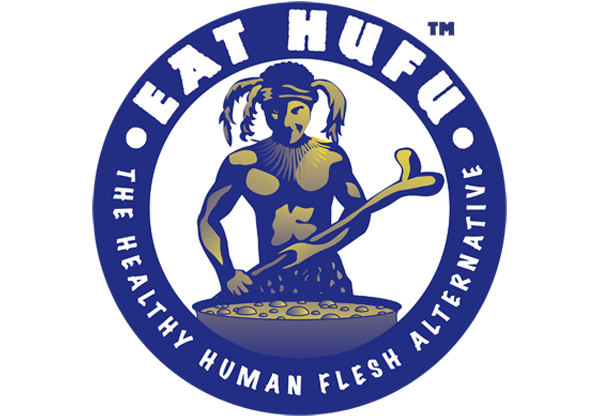 As Hufu’s Mark Nuckols puts it, “ We found there's a real market for human flesh substitutes not being met by companies like General Foods, etc., and yes, Hufu is tasty and nutritious and easy to make into exotic recipes. 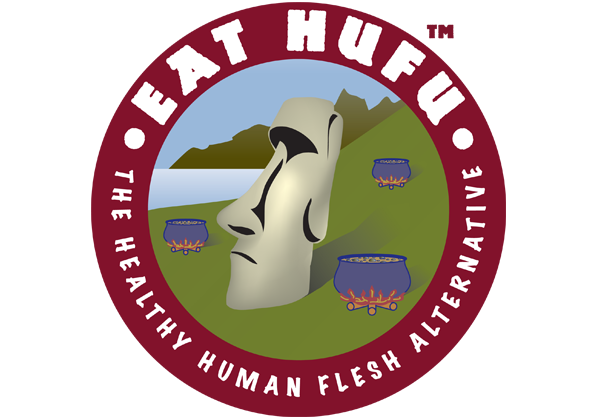 We also found that Hufu is a great product for cannibals who want to quit. 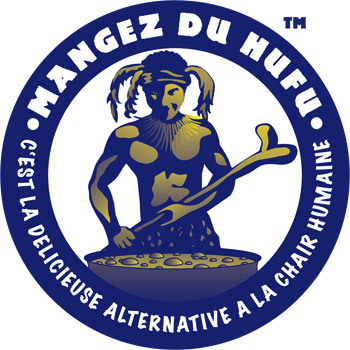 Hufu is also a great cannibal convenience food—no more Friday night hunting raids ”. Obviously an idea designed to get a rise out of people, Nuckols needed imagery which would convey the history of cannibalism & Hufu’s tongue-in-cheek sense of humour. ardes were proud to step up & create some memorable imagery. ardes were asked to come up with a series of images that would be suitable for t-shirts, barbecue aprons, cookbook covers & more. The West’s fascination with cannibalism is long-lived & Hufu wanted to take advantage of this. The designs were to be a combination of both serious & funny, playing upon old B-movies from the 1950’s, “Far Side” cartoons & music—The Cramps’ “The Natives Are Restless” was a particular inspiration. We believed that the designs should have a mixture of both fun & menace, with the characteristics of food commercials (as for tomato sauce): the blissful, satisfied smile the actors have after having tasted that perfect sauce. After all, the whole idea is that this is a food product: having a combination of menace (it’s like eating people! ), fun (it’s just a joke!) and bliss (it’s so tasty!). Another requirement of the design was to avoid any suggestion of racial prejudice. Apart from airline crashes in the Andes, cannibalism (in the popular mind, at least) is something done by non-Western people. We wanted to poke fun at the idea of cannibalism, but not make fun of people. It’s a fine line to tread. 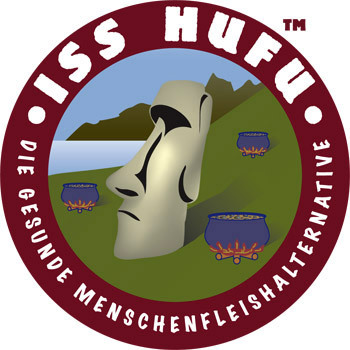 ardes supplied three initial images to Hufu: what we call “Easter Island” (red roundel), the “Hungry Native” (blue roundel) & the sensitively-named “Fat Guy” (rectangle). All feature prominently on Hufu’s website & marketing material. The “Easter Island” image is perhaps the most esoteric of the three: it makes sense if you know the history of the island. The inhabitants spent so much time building their giant statues & warring with each other that they ran out of food & resorted to cannibalism. In the image, we have one of the statues, quite a few boiling pots, but no inhabitants—the joke being that they’ve all been eaten. The “Hungry Native” design was a more sensitive piece. We used elements of clothing from several old photos of South Sea Islanders, but we were worried about the face. Designing a funny image of a cannibal—without resorting to caricature—is difficult enough. How do you avoid any suggestions of racism? Designer Ray Drainville used his own face (but not, alas, his body) for the image. The cannibal’s grin, evocative of both fun & menace directed towards the viewer, was easy for Ray to produce. The “Fat Guy” design was influenced in part by old travel posters & “Drink Coca-Cola” advertisements from the 1940’s. It’s meant to look like an advertisement from an alternate universe where people eat tofu-based human flesh substitutes instead of Coca-Cola. Media response to the whole Hufu idea has been explosive. ardes’s Hufu imagery has been reproduced across hundreds of blogs & newspapers. Most importantly, Hufu & our designs have featured on Comedy Central’s comedic news hit “The Daily Show”: Flesh In the Pan” by reporter Samantha Bee). Since the project’s onset, ardes have produced variations of the designs in French & German, reflecting the expansion of the Hufu empire. Further themed Hufu designs are planned: Soylent Hufu (It’s not made of people), spicy Aztec Hufu, chilled “Alive!” Hufu & more. Stay tuned! See more examples of our poster design.